Didot Fonts: History | Hoefler & Co.
“It’s an experimental typeface” is something we hear a lot these days. I was startled to catch myself saying it recently, in defense of a strange and unruly thing I’d made (which perhaps you’ll see in a future release from H&Co.) I’ll confess to having reached for the E-word as an alibi, an exemption from the scrutiny which awaits any new font: what does it feel like? does it really work? what can I use it for? Applied in this way, ‘experimental’ becomes a useful disclaimer, conveniently foreclosing the discussion. But careful, there: don’t touch that, it’s experimental — what liberal mind would dare pass judgment? The ‘experimental’ section of any new type catalogue is likely to be its largest, brimming with new fonts which have presumably escaped classification elsewhere. That this category is likely to contain so few older designs (if it contains any at all) makes it tempting to think of typographic history as a superabundant now versus a business-as-usual then. Perhaps the sheer volume of this recent output reaffirms the feeling that our generation is the first to experiment, to deconstruct, to formulate insightful theories and question unexamined truths — whatever the reason for these suppositions, they overlook an important fact: typography has always been experimental. In researching historical material for the HTF Didot typefaces, I was introduced to some remarkable typographic experiments begun by Enlightenment thinkers at the turn of the seventeenth century. There is a shocking modernity to their writings, in which aesthetic decisions are substantiated in historical, cultural and scientific terms; Henri René Luce’s catalog of 1771 includes a thousand-word essay on the formation of serifs in his types, discussing how and why they differ from traditional designs. Although these writings were certainly complicit in great acts of self-promotion, they remain valuable reference works, and superb typographic specimens. The enduring value of any experiment lies not in its hypothesis or its procedures, but in the conclusions it ultimately presents. Perhaps the time has come to reflect on these conclusions, and to present them in a context that invites comment and criticism. The history of typography is rich with invention, and the work of typographers past remains relevant to our own. In the hopes of learning from their experiments, perhaps we might begin by observing their traditions. The term ‘historical revival’ has been used to describe a number of approaches to the revisitation of historical forms. Strict imitations of typographic artifacts have obvious shortcomings, as do looser interpretations which are not so much ‘revivals of’ a particular source as they are ‘occasioned by’ them. Somewhere between these extremes is HTF Didot, a family of original typefaces which quotes freely from the formal vocabulary of the eminent French typefounder Firmin Didot (1764-1836). More than just handsome specimens, Didot’s types are an important part of the typographic fossil record, for they document how typefaces were beginning to be conceived during the Enlightenment, and how they have been conceived ever since. It is no coincidence that the very word ‘Didot’ has entered the typographic lexicon. The Didots were an illustrious family who for nearly two centuries served as typefounders and master printers to the crown of France; their contributions include the cutting of microscopic types, the revival of stereotyping, the perfection of the endless-paper machine, and perhaps most importantly, the development of a standardized system of type measurement which has survived to this day: .376mm = 1 didot. 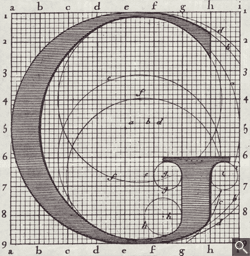 From the Médailles de Louis XIV of 1700: a copperplate engraving by Louis Simmoneau showing a construction diagram for the capital G. Each large square was divided into 64 sections, each of which was subdivided into 36 subsections. The designs of the Académie compared with their interpretation as printing types. At top, Simmoneau’s copperplate engravings of 1695; below, punches modeled on these letters, made by Phillipe Grandjean in 1699. The first of the Didot types appeared in 1781, at the end of a long typographic continuum which, to modern eyes at least, seems relatively unvaried. Between Nicolas Jenson’s seminal humanist typeface of 1470 and the old styles of the early eighteenth century, there is a 250-year period marked less by innovation than by a steady improvement in the design of letters. As the center of European printing moved north, fifteenth century Venetian types gave way to sixteenth century French models, which were in turn assimilated into the Dutch and English old styles of the centuries to follow. 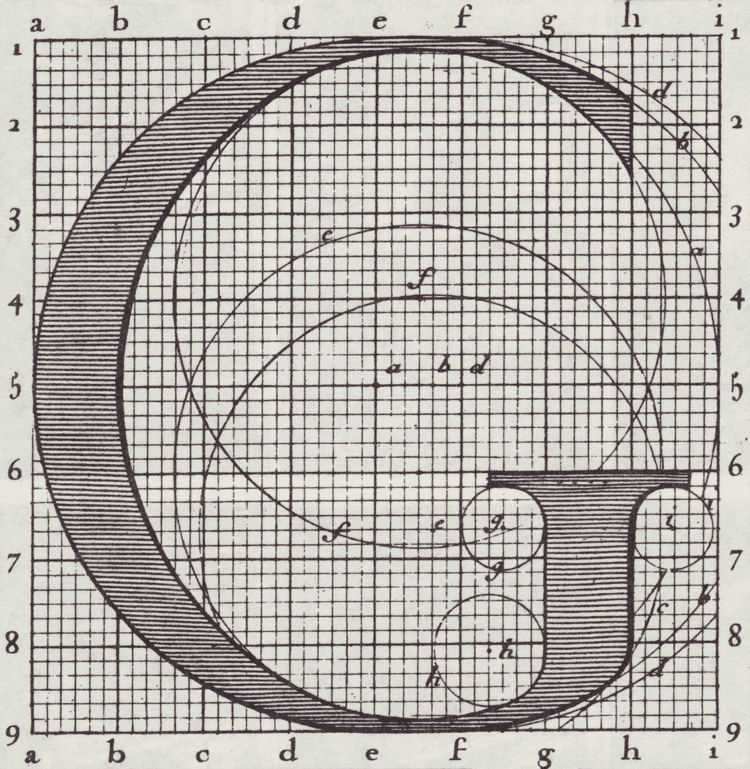 Taken together, these types describe a slow progression away from the alphabet’s calligraphic origins — stress angles shifting from generally diagonal to horizontal, bracketed serifs beginning to suggest the graver more than the pen — and by the end of the seventeenth century, printing types began to evidence a distinct and autonomous visual vocabulary. Gone are the irrelevancies of calligraphy, replaced instead by the spurs, beaks, serifs and terminals of modern typography, a coherent system of parts which hinted at the critical rationalism of the Age of Reason. It is worth noting that by the close of the seventeenth century, the history of typeface design as we know it had yet to begin. In the centuries since Gutenberg, type design had been little more than typefounding, the immediate business of replacing exhausted printing types with fresh stock. While more and more type was made by increasingly skilled and specialized punchcutters, and changing fashions marked preferred styles for success (and the rest for smelting), nothing suggests that the types of this period were created out of anything more than a material urgency — and certainly they were not, like modern faces, the result of an articulated design concept. The first attempt to rethink the design of the alphabet came about at the close of the seventeenth century, when a committee of French academics was convened to study the formation of the perfect roman letter. Perhaps because the roots of typographic style had been established through custom, rather than achieved through rational discourse, the committee set about improving the alphabet, suggesting “cases where advances might be made, or at least what it considered to be desirable... [to create a] new French alphabet...chosen to please the eye as far as possible.”1 1. Histoire de l’Académie royale des sciences...avec les mémoires (Paris, 1699) pp. 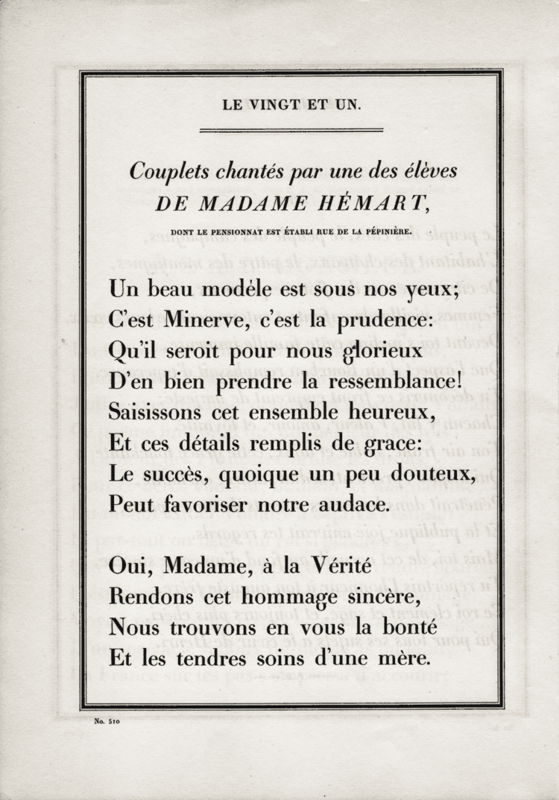 117 et seq., quoted in André Jammes, “Académisme et Typographie,” Journal of the Printing Historical Society No. 1 (1965) p. 78. With typical Enlightenment panache, they justified each of their improvements scientifically: included in their weighty report was a volume of superb engravings, meticulously diagramming the geometric construction of each letter on a grid of some 2,304 squares. When Louis XIV incorporated this committee into the Académie des Sciences, the council he organized for the staggering undertaking of recording for posterity an account of all the realms of human endeavor (an enterprise which was somehow never completed), the first of these engravings became the conceptual basis for a new series of types made for the exclusive use of the crown: cut by Phillipe Grandjean beginning in 1694, these are the romains du roi, the King’s romans.2 2. The ‘romain’ of the romains du roi are not romans as opposed to italics, but Latin types as opposed to Greek ones: Garamond cut a grec du roi some time in the 1540s. There are considerable differences between the romain du roi types and the engravings of the Académie which inspired them, but collectively they are letters of striking originality which truly defy classification. The types evidence less of the ruthless geometry of Louis Simmoneau’s elaborate engravings, and although typographic lore has always suggested that Grandjean, an experienced punchcutter, deferred to his professional experience and took liberties with the academicians’ blueprints, even these concessions to serviceability were understood by the Académie, and indeed sanctioned by it. The different proportions required of large and small types was evident early in the development of the faces, as the academician Nicolas Jaugeon observed: “Since large objects reduced to small ones often change in grace as well as size, we noticed that in proofs taken from punches the letters looked far too thin.”3 3. John Dreyfus, Aspects of French Eighteenth Century Typography (Cambridge: The Roxburghe Club, 1982) p. 15. The memoirs of the Académie conclude with a welcome regard for empiricism: “we were reduced to consult principally the eye, the sovereign arbiter, though somewhat uncertain in its decisions.”4 4. Jammes, p. 82. His investigation into the history of the romains du roi debunks the anecdotal history of Grandjean the maverick, and fully explores the interesting synergy between Philippe Grandjean’s types and Louis Simmoneau’s engravings. Since some characteristics of Grandjean’s types are reflected in the later engravings, the relationship between the planning committee and its appointed manufacturer might best be described as symbiotic. Simmoneau’s construction diagrams for italic letters were built on a frame of parallelograms, though inscribed with circles that resisted the slant of the grid. 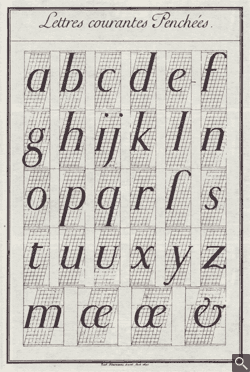 Simmoneau’s preliminary plan for the design of the italic lowercase. In this diagram, a number of cursive affectations have been applied to obliqued roman forms: compare the fully calligraphic e, x and z, with the resolutely typographic k, n and u. 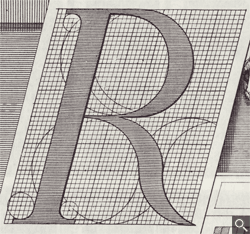 The first public appearance of the romain du roi in 1702 marked a watershed moment in the development of typographic history. Stylistically these were types of shocking innovation, for made as they were in the image of a society which cherished the use of reason to scrutinize long established customs, these were designs which had no place for even the most vestigial traces of the calligraphic tradition. Conceptually, however, these types were of even greater significance, for the aesthetic discourse between Grandjean’s types and the Académie’s engravings qualifies these as history’s first truly designed types. 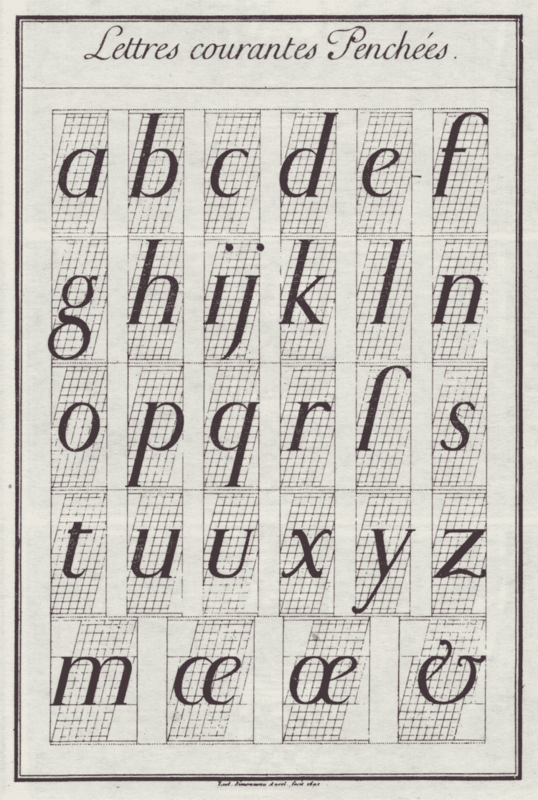 Although the basic elements of a typeface had long been established by convention, the work of the Académie was unique in that it articulated these conventions as formulae. The design of a typeface was no longer seen as an arbitrary array of shapes fixed only in custom, it was now recognized as a rational system of interrelated parts, a set of gridded equivalencies and departures from the grid. Epistemologically, this shift is akin to the break with Neoplatonism, the medieval school of thought which judged all things in terms of their proximity to a perfect form. Instead of evaluating a letter b in terms of its participation in a slippery notion of b-ness, the Académie defined the qualities of a b in terms of its relationship with the d, p and q, and indeed the rest of the alphabet. This relativistic approach, played out to its natural conclusion, would give rise to the Structuralism of early twentieth century linguistics, a method of critical analysis which concentrated on the measurable relationships between abstract parts, rather than the inestimable parts themselves.5 5. The problematic application of linguistic theory to the visual arts is adroitly handled by Ellen Lupton and J. Abbott Miller in “Type Writing: Structuralism and Typography,” Emigre No. 15 (1990). An expanded version appears as “Laws of the Letter” in Design Writing Research (New York: Princeton Architectural Press, 1996) p. 53. Nowhere was this ‘proto-structuralism’ more evident than in the design of the romain du roi’s italic. Like the roman, the italic suggested a number of alphabetic improvements, such as the regularization of the italic angle, and the abolition of arbitrary extravagances (the recurvate h and v were turned outward.) Moreover, since it postulated that italics were merely upright roman letters adapted to a sloped grid — a transformation which eerily anticipated digital manipulations — it suggested that even mass adjustments to the system could be considered successful, if applied consistently throughout a typeface. Oblique the grid and you have an italic; thicken all the strokes and you have a bold; thicken all the serifs and you have a slab serif; truncate all the serifs and you have a sans. A century later, these ideas would find purchase in the culture of the Industrial Revolution, and would give rise to the host of variations which make up the modern typographic palette. And the idea that a typeface could be produced using a set of intrinsic rules, and evaluated in terms of how it observed or rejected these rules, effected the development of the same sort of objective criticism which had long existed in the other arts. If the conceptual possibilities afforded by the romain du roi were slow to be recognized, their aesthetic appeal was not. Within a decade of their introduction, commercial typefounders were snubbing the royal decree which prohibited imitation of the royal types, and introducing their own comparable designs. Some published faces celebrating the goût nouveau, others produced blatant knock-offs. A few counterfeiters copied the tell-tale eccentricities peculiar to the romain du roi, like its bi-directional ascender serifs, and its bewildering lowercase l which featured a spare serif halfway up its left side.6 6. Dreyfus, p. 18. One theory suggests that the romain du roi’s peculiar lowercase l pays tribute to French gothic manuscripts, where such marks additionally make an appearance on the occasional b or h. For an illustration which implicates this theory, Dreyfus refers us to a thirteenth century French pontifical, reproduced as facsimile 185 in Sir Edward Maunde Thompson, Introduction to Greek and Latin Palæography (Oxford, 1912.) Whatever its inspiration, this mannerism became so singularly associated with the crown that its imitation by other printers ranked as an offense of counterfeiting! Louis Luce, a punchcutter connected with the making of the royal types, continued to design types in the following years with the same degree of slenderness and modeling. The prolific typefounder Simon-Pierre Fournier le jeune created types of a similar style, which he displayed in an exceptional set of type specimen books issued in 1742. 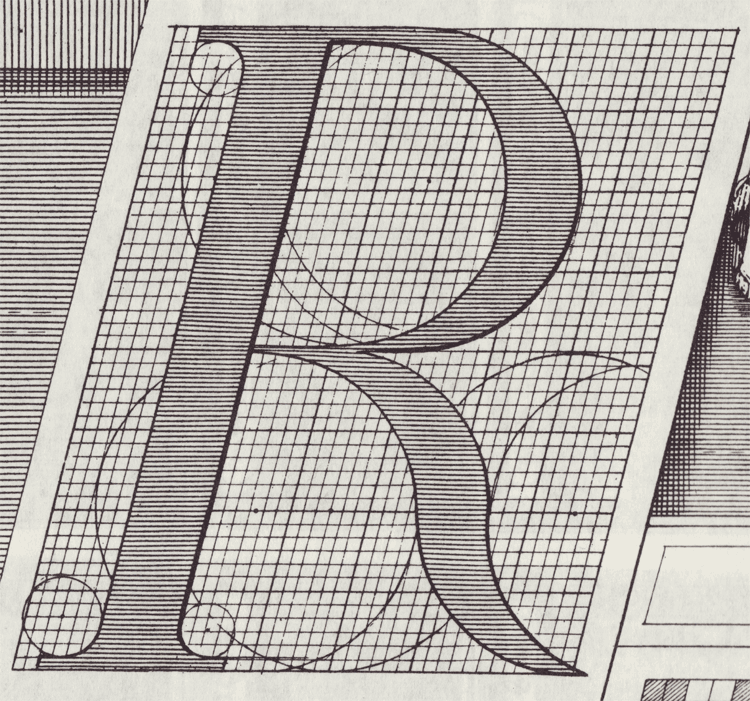 While the distinguishing marks of the romain du roi slowly vanished from the types of its imitators, the style it introduced persisted well into the reign of Louis XV, when advances in presswork and paper manufacture made it possible to continue the design of increasingly sharp and thin typefaces. 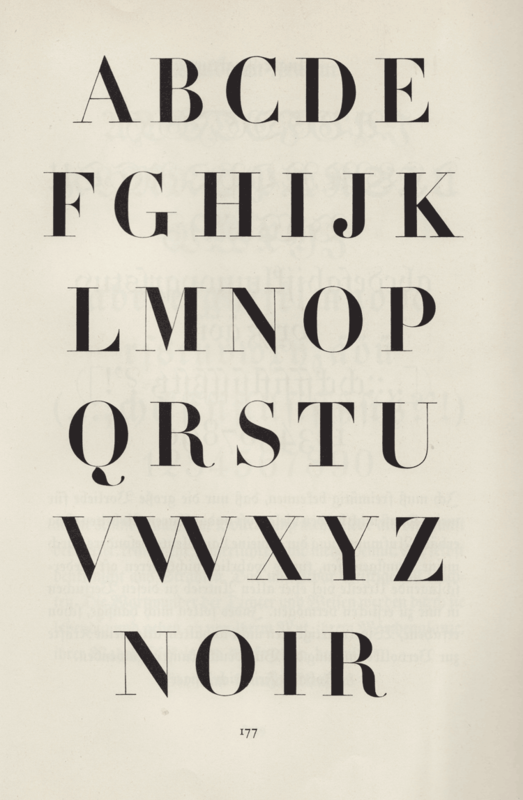 This pursuit was not limited to French typefounding: in Holland, Jacques-François Rosart and Johann Michael Fleischman developed sparkling typefaces of a unique and distinctly Dutch character; French political maneuvers abroad undoubtedly affected the style of Giambattista Bodoni in Parma. In England, typography of great elegance and repose was achieved through both the design of typefaces and their application, especially by the printer John Baskerville, whose editions featured broad margins, generous leading, and smooth calendered papers. All of this contributed to an aesthetic which found great audience on the continent, especially among the French, and most especially among the Didots. The spur halfway up its left side makes the lowercase L one of the most conspicuous characters in the romain du roi. At left, the construction diagram from the Médailles confirms that this was an intentional detail, and was preserved when the fonts were made as type by Grandjean, center. This flourish has calligraphic crendentials, appearing on the stem of all ascenders in the gothic lowercase in both written and printed form: at right, Didot’s 32pt gothique from the 1819 Specimen des Caractères. So strong were this detail’s connotations that the ‘spurred L’ was preserved for generations by typefounders who served the French crown. Above, some typefaces in the collection of the French national printing office, the Imprimerie Nationale: 13pt le Jaugeon, 1692-1696; 28pt le Grandjean, 1693–1745; 20pt le Luce, 1740–1770 (note its curious right-facing spur); 36pt le Didot Millimétrique, 1811; 28pt Marcellin-Legrand, 1825–1827; and a lone twentieth-century example, 18pt le Gauthier, 1969–1978. The stylistic heritage of the romain du roi, at least as it had been interpreted and handed down by Fournier and Luce, was encapsulated in a typeface cut by Wafflard for François-Ambroise Didot in 1781. In addition to the horizontal stress and almost interchangeable serifs of the prevalent style, this type hinted at some unusual variations on the familiar theme: heavier contrast, exaggerated modeling, and unbracketed serifs. Under the guidance of Firmin Didot, these qualities would be concentrated, becoming trademarks of the Didot style, ultimately culminating in the types of 1800 which this revival hopes to celebrate. These were types which exalted the mathematical and extolled the classical, types acclaimed by the London Universal Exposition of 1851 as “the most perfect typographical production of all countries and all times.”7 7. Albert J. George, The Didot Family and the Progress of Printing (New York: Syracuse University Press, 1961) p. 8. They effected a unique resonance in the court of Louis XVI, where an appreciation for the antique was in full flower, epitomized by the style Louis Seize and its celebration of the noble simplicity and calm grandeur of the Doric order. Didot’s contemporaries saw in these types both a splendid reflection of antiquity, and a symbolic reproduction of their own age. Rational, progressive, evocative, these types were the ultimate expression of Enlightenment thinking, and the final destination of the Academy’s long philosophical journey. Unlike metal types which are physically preordained for use in a specific size, digital type has flexibility of scale. Any font can be used at any size, in response to which most typeface manufacturers long ago adopted a policy of “one size fits all,” producing master designs which are hardy enough to withstand text composition, but are consequently rather pallid when enlarged. Because of the effort involved in making duplicate designs for text and display, very few typefaces are produced this way; even Adobe’s Multiple Master faces, against the background of their tremendous font library, seem rare showpieces. 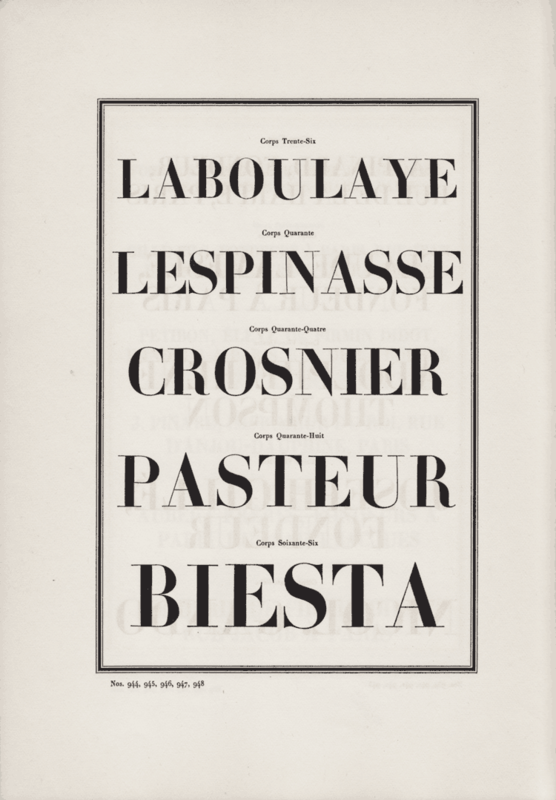 It was in response to this bland typographic landscape that Harper’s Bazaar commissioned the development of HTF Didot, for their celebrated 1992 redesign art directed by Fabien Baron. The original brief, for a display face of the Modern genus (like Bodoni or Didot), called for a pair of display types in roman and italic exclusively for use at sizes in excess of two inches. The vicissitudes of editorial publishing soon required types for smaller sizes, as well as a companion boldface for text, and gradually the project grew to include an extensive family of variations: three weights, each with an italic, each provided in seven master sizes to accomodate composition from six to six hundred point. The historical source which engendered the first design, the large size master of HTF Didot Bold, was the magnificent set of capitals appearing in Tschichold’s A Treasury of Alphabets and Lettering. Tschichold attributes this type to Firmin Didot, as do various reproductions, though perhaps it is more likely identified as the grosse sans pareille no. 206 of Molé le jeune, exhibited at the Exposition du Louvre in 1819. It is a type very much in the style of the Didots, indeed surpassing any of the Didots’ designs in elegance and refinement. In a moment of uncharacteristic equanimity, type historian Daniel Berkeley Updike described the Molé type as “this kind of type at its best.”8 8. Daniel Berkeley Updike, Printing Types: Their History, Forms and Use, Third Edition (Cambridge: Belknap Press, 1962) vol. II, p. 182. The text version, less dependent upon a single specific source, was more of a synthesis of the better characters by both Pierre Didot and his punchcutter, Vibert, for none of their faces are without considerable shortcomings. (Trolling the type specimens in this way is certainly a time-honored practice; Fournier, in creating his own typefaces, surrounded himself with the type specimen books of his contemporaries: “I took from each what seemed to me good, without becoming a slave to any.”)9 9. Dreyfus, p. 23. Regarding the process of sorting material for a historical revival, the term “anthology” is a good one, and I owe it to Matthew Carter, who used it in describing the design of Galliard. For this comment, and other observations which provide a useful ingress to working with historical forms, see John Downer, “Copping an Attitude, Part 2,” Emigre No. 38 (1996) p. 14. A facsimile of the 1819 specimen book of Pierre Didot, reproduced by Enschedé in 1931, provided a useful cross-section of many types, as well as a generous showing of the roman and italic corps dix-huit which ultimately figured quite prominently in the text versions. Until the development of the pantographic punchcutter at the end of the nineteenth century, it was impossible for metal types of different sizes to be based on the same pattern. As a result, Didot’s types evidence great inconsistencies from one size to the next, in not only their styling but their weights and widths. An early imperative of the project was therefore to rationalize the material at hand into a coherent grid of weights, which was complicated by the fact that Didot’s types predate the invention of the boldface (or at least the paradigm of the ‘companion bold’ for emphasis.) The lightness of the text faces of Didot and Vibert, taken together with the great heft of Molé’s display types, seemed to recommend these as historically appropriate limits, so the proportions of these two extremes were preserved in the development of the large size bold master, and the small size light. Didot’s display-size letters as reproduced in Tschichold, compared with their digital interpretation as HTF Didot. These letters are from the 96pt Bold, the largest of HTF Didot’s seven sizes. One technique which is especially useful in the creation of size-specific typefaces is interpolation, a process by which digital typefaces with similar designs can be mathematically mated to create intermediate styles. This process is the cornerstone of Adobe’s Multiple Master technology, which was used in the development of these faces. Unlike a traditional family of fonts, which exists as a set of discrete variations, a Multiple Master contains counterpart styles which together describe an axis of mutability: a light and a bold, for instance, provide access to the weights in between. HTF Didot has two such axes, one for weight and one for optical size, and thus requires four master designs to describe the full grid of variations: large size light, large size bold, small size light and small size bold. Blending the light and bold versions produced a medium, while blending the large and small size masters yielded seven size-specific variations, for use at six, eleven, sixteen, twenty four, forty two, sixty four and ninety six point. Generated from this matrix were the typefaces provided to Bazaar, and now available generally: light, medium and bold, each appearing in seven sizes, each in roman and italic — in all, forty two variations. This specimen book inaugurates their release, and contains a broad showing of each of the typefaces in both historical and contemporary settings. If they prove to be serviceable for modern needs, perhaps they are yet another testament to the foresight of the Académie. 1. Histoire de l’Académie royale des sciences...avec les mémoires (Paris, 1699) pp. 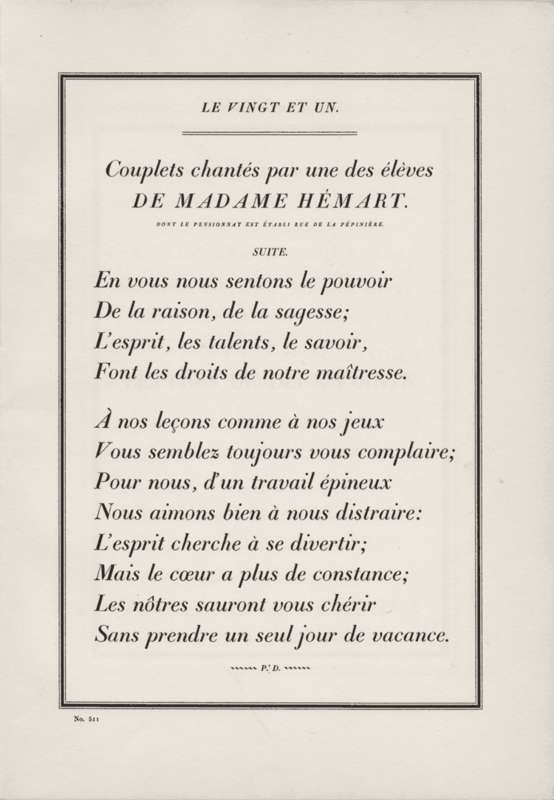 117 et seq., quoted in André Jammes, “Académisme et Typographie,” Journal of the Printing Historical Society No. 1 (1965) p. 78. 2. The ‘romain’ of the romains du roi are not romans as opposed to italics, but Latin types as opposed to Greek ones: Garamond cut a grec du roi some time in the 1540s. 3. John Dreyfus, Aspects of French Eighteenth Century Typography (Cambridge: The Roxburghe Club, 1982) p. 15. 4. Jammes, p. 82. His investigation into the history of the romains du roi debunks the anecdotal history of Grandjean the maverick, and fully explores the interesting synergy between Philippe Grandjean’s types and Louis Simmoneau’s engravings. 5. The problematic application of linguistic theory to the visual arts is adroitly handled by Ellen Lupton and J. Abbott Miller in “Type Writing: Structuralism and Typography,” Emigre No. 15 (1990). An expanded version appears as “Laws of the Letter” in Design Writing Research (New York: Princeton Architectural Press, 1996) p. 53. 6. Dreyfus, p. 18. One theory suggests that the romain du roi’s peculiar lowercase l pays tribute to French gothic manuscripts, where such marks additionally make an appearance on the occasional b or h. For an illustration which implicates this theory, Dreyfus refers us to a thirteenth century French pontifical, reproduced as facsimile 185 in Sir Edward Maunde Thompson, Introduction to Greek and Latin Palæography (Oxford, 1912.) Whatever its inspiration, this mannerism became so singularly associated with the crown that its imitation by other printers ranked as an offense of counterfeiting! 7. Albert J. George, The Didot Family and the Progress of Printing (New York: Syracuse University Press, 1961) p. 8. 8. Daniel Berkeley Updike, Printing Types: Their History, Forms and Use, Third Edition (Cambridge: Belknap Press, 1962) vol. II, p. 182. 9. Dreyfus, p. 23. Regarding the process of sorting material for a historical revival, the term “anthology” is a good one, and I owe it to Matthew Carter, who used it in describing the design of Galliard. For this comment, and other observations which provide a useful ingress to working with historical forms, see John Downer, “Copping an Attitude, Part 2,” Emigre No. 38 (1996) p. 14. Optical Sizes. To preserve the typefaces’ delicate features, each of Didot’s six styles is provided in seven different versions to tackle different size ranges. Language Support. Didot features our Latin-X™ character set, covering more than 140 languages throughout the world — including all of Central Europe.